Every kid loves a paper airplane - they don't stop to consider how much learning is involved. That makes for perfect educational experiences that are just plain fun! This Minute offers the perfect opportunity to introduce or reinforce procedural writing skills. The 15 steps outlined in text and image that follow the Minute show the reader how to construct their own airplane. Have your students discuss the importance of the images in this set of instructions. Are images always necessary in procedural writing? Brainstorm a list of of things that would require good procedural writing skills - recipes, directions, assemblies, etc. Once your students have generated a list, challenge them to prepare some good directions for a partner to follow. There are a lot of complex critical thinking skills involved here. Go for it! Have your students take a look at the eastern origin of the art of paper folding. As they gather information, have them identify the cultural and social aspects of the history, from the role that location played in the practice, to the religious and recreational aspects of the practice of folding paper. Mary Kay Carson introduced airplane directions of yaw, roll and pitch in her Minute, and here Author Adkins adds the ideas of weight, thrust, lift and drag. Challenge students to explore these concepts and experiment with how they all work together. How does a change in one affect the others? Let your students experiment and test and then share what they have learned. A contest to see who can design a paper airplane that goes the farthest is never a bad idea. Origami is an art form that may have its origins in ancient Japan, but has enjoyed a relatively recent revival and transformation thanks to artist Akira Yoshizawa, considered the father of the modern origami art movement. Introduce your students to this fascinating art form and invite them to try out some paper folding of their own. For older students, consider checking out the PBS documentary, Between the Folds. 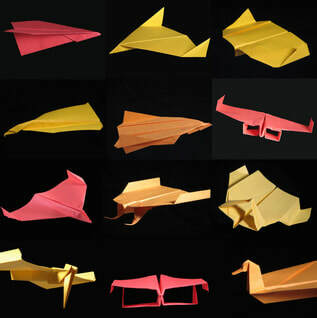 Take a look at Ted Talks by doing a search for origami. Robert Lang has a fascinating fifteen minutes that connects math, paper and art. Bruno Bowden recreates a Lang composition while blindfolded and accompanied by cellist Rufus Cappadocia - in under one minute. Or search for aerodynamics and check out the Ted Talk on A Robot that Flies Like Bird. Introducing students to fascinating Ted Talks will encourage them to sate their own curiosity by exploring these high quality videos by experts from around the world.